Choosing a calculator is about more than convenience and functions. Casio’s new Colorful & Stylish calculator line-ups offer an exciting range of choices, with stimulating colours and assured quality design, to suit every user’s individual lifestyle. One is sure to find a MY STYLE calculator that’s perfect for their usage. single-tone design. The two series include the Colourful Calculators available in wide range of vibrant colours to cater to diverse aesthetics and the Stylish Calculators for a more professional look, with a metal finish in 7 colours namely Navy Blue, Gold, Blue, Grey, Pink, White, and Black. These slim-profile calculators feature a beautiful, fine-quality texture rendered using alumite treatment. Compact Desktop type, the JW-200SC (12 digits / 7 colours), has a tilt display that can be easily adjusted to set the viewing angle – let’s you control who can see your calculations. This exclusive and premium look of the product and feature, makes it suitable for every corporate executive. The colors available also gives you an option to select as per your office theme. 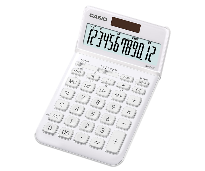 The Portable type model, the SL-1000SC (10 digits / 7 colours) fits easily into your pocket while you travel, and lets you do all the calculation in all your meeting in or outside office. The calculator compliments your lifestyle with its attractive look.